Sometimes I think my almost-3-year-old is in charge of me, versus the other way around. Today were in the parking lot at daycare, after loading ourselves and all our Stuff up. I climbed into the driver’s seat, started the ignition, put on my snazzy new sunglasses and buckled up. As I pulled into reverse, I hear Punkernoodle One from the backseat, in a semi-delighted, semi-outraged tone: “Mommy! YOU FORGOT TO BUCKLE ME UP.” Holy *&@#. I did forget to buckle her in. What am I thinking? Long day. I get out, buckle her purple-flowered Britax in all its complicated glory, and tell her she did a great job reminding me. Silly Mommy, I say, mocking myself with an exaggerated eye roll. Yes, she’s a bossy one. But too cute to get mad at much. She’s still relishing in her sun-soaked beach weekend. 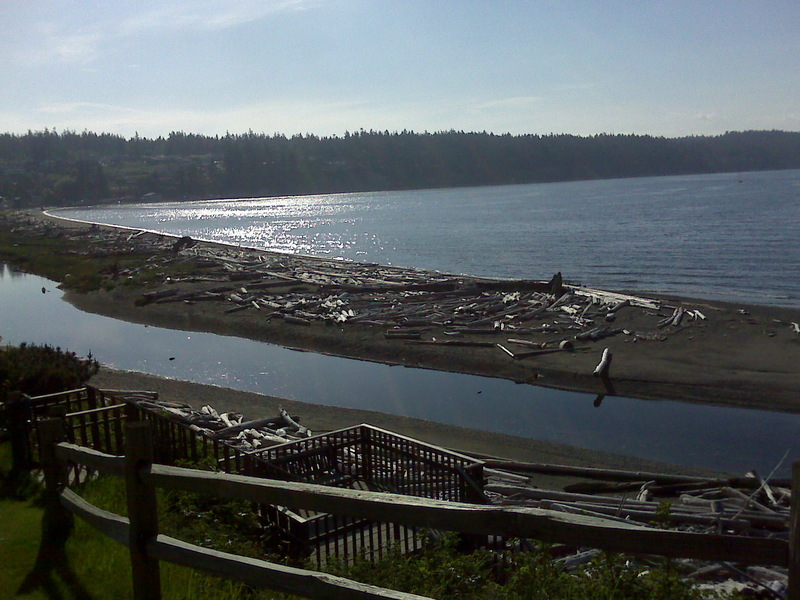 We rented a little cabin overlooking the most spectacular spit of sand, rimmed by a stunning driftwood logjam, on Camano Island. Both Punkernoodle One and Two had a blast, scooping sand, hunting for shells and crabs, and eating their first roasted marshmallows. 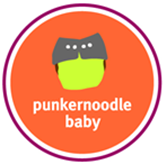 It was a bittersweet weekend, because Punkernoodle Two turned 1, technically meaning the end of babyhood in our home. She’s taking to it with gusto, perfecting a new scream that emanates every time frustration strikes and a new back arch that would rival a Seattle rioter. We used disposables, 7th Generation, to make the weekend easier – plus the car was so stuffed I don’t think we could have gotten a cloth diaper in there. Hopefully we made up for it carbon-footprint-wise with all the walking and playing locally. We just got back from the Green Power Baby Shower in downtown Seattle. It was the debut of our cloth diaper and conscious fiber business. People bought stuff! Yay. They also said they would check out our Web site, punkernoodlebaby.com. Another Yay! We’re also pooped. It was hard work hauling everything to the show, setting it up, talking dipes all day and then hauling it off, especially with our daughters in tow. But it was fun and we’re glad we finally got this enterprise launched. Thanks to all of you who stopped by and made the debut of our new company a success. Hope to see many of you swing by and check out our stuff at our Ballard home. We’ll be scheduling appointments on Saturday mornings to show you our diapers, let you see everything we’re selling and let you try different diapers on your baby. We’re going to pass out now. Bye! So it’s the day before we officially kick off our new cloth diaper biz. 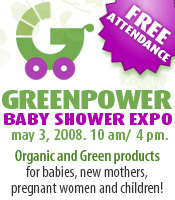 Saturday we’ll be debuting at the Green Power Baby Shower in Seattle. The show, which we think will draw mostly pregnant women and their partners, will open at 10 a.m. We’ll be there at 7 (hopefully) with a grouchy 2 1/2 year old and a babbly 1-year-old in tow. The baby will be our model for the day, decked out in her finest cloth diapers (GAD hot pink with black fleece interior, Happy Heinys knit poodles, Knickernappies melon, to name a few), plus of course some adorable BabyLegs. The toddler might sport some warmers on her legs or arms, but she’ll mostly be interested in getting into the for-sale toys and finding snacks. We’re nervous and excited to be embarking on a new venture, and despite the exhaustion of preparing our grand opening, we’re thrilled that we’ve made it this far. We don’t expect to sell too much – we think many parents-to-be will just be starting to think and learn about cloth diapers, and will be making their purchasing decisions after they’ve planned and thought some more. But we hope to be a wealth of information, and maybe sell some sweet organic toys, fair-trade onezees and – most importantly – some eco-consciousness. And for the open-minded, THAT’S free. So we’ve been planning this start-a-new-cloth-diaper-business thing for months, and just days from finally launching our new business (look for us at the Green Power Baby Shower at the downtown Seattle Shearton on Saturday, May 3), we started to realize how much of an uphill battle selling cloth diapers may be. Family came into town with their 6-month-old baby in tow. One parent was curious about our business and cloth diapers and the other was adamantly against them. He had done his research and concluded that disposables are better. We showed them colorful pocket diapers, trendy wraps, the works. Tubs and tubs of them. They were impressed but unconvinced. They were hanging their concerns on how much water it would take to wash them. We were talking about not using petroluem-based products that would go to a landfill. Advantage us. Ease of use? We’ve been washing cloth diapers in our washing machine for three years. No problems, easy. The only tough part is having to use a sprayer to occasionally wash the poop off. No big deal. It’s hooked up to the toliet, just spray and drop the diaper into your diaper can. Smells better than a stinky plastic diaper. You already have to deal with the stuff anyway, so what’s one more step. They agreed to try one. It was a tester and probably too small. Time ran short and they left without any of our diapers. Doing the right thing may be harder than we thought. We’re ready. We’re game. We think there are people who want to do this. There has to be because it’s the right thing to do. Maybe they’ll call us later and ask us for some cloth diapers. We can hope.